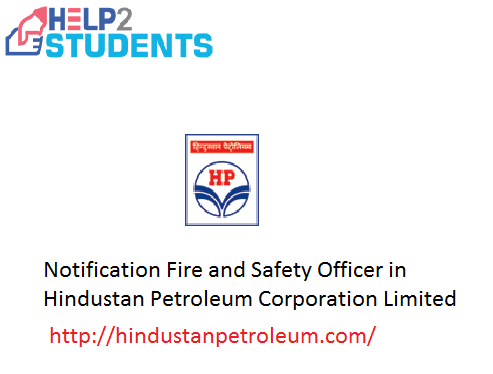 Notification by Hindustan Petroleum Corporation Limited to fill its 11 vacancies of Fire and Safety officer in various places of India.Apply through online Last Date for Application is 31.8.2018. Age Limit is 27 Yrs. Hindustan Petroleum Corporation Limited has released notification for Fire & Safety Officer Which has 11 Vacancies.Applications through Online, Opening Date of Applications is 31.7.2018 and Closing will be 31.8.2018. Educational Qualification: B.Tech/BE on Fire Engineering or Fire & Safety. Selection Process: Written Test + Group Task + Single/Multi-stage Interview. Application Fee: Rs.590/- for General and OBC Candidates SC, ST And PWD Candidates are Excepted from payment of Application Fee. Important Dates: 31.7.2018 Opening Date of Applications. 31.8.2018 Closing Date of Applications.